The City of Galveston Texas, a True Romantics Getaway. I love getting ready for a trip to City of Galveston Texas. I’m happy and excited. Every return is filled with anticipation. It’s like seeing an old friend after a long time away. At the crest of the causeway the island comes into view. The warm Victorian city seems to welcome you. It seems to say; where have you been so long? We’ve been waiting for you. It is such a lull from the mainland. Feeling romantic? Of course we are! Has it been a while since you’ve seen gas lighted street lamps? 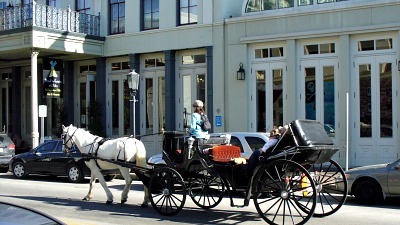 They are the norm here as horse and carriages glide past them. With the sound of horse’s hooves it can be hard to remember the date. It’s a fun feeling, a real get away. That is here. The downtown buildings and general scenery remained in tack. Even after several disasters: storms, hurricanes, Yellow fever plagues, economic decline, historic battles, and sweeping fires. The changes the city underwent were a roller coaster ride along the decades. But here it is. 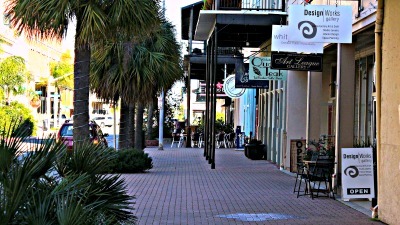 The Strand is a National Historic Landmark. You are walking in history. It’s all around you in the City of Galveston. Heck you can feel it at times. You don’t need an active imagination either. 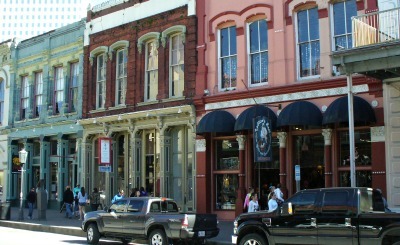 Throughout the City of Galveston are cast Iron frame buildings. The three elegant facades are of cast iron construction. Each one gives a unique character to the building don’t you think? During the Great Storm the buildings were seriously damaged. Thanks to preservation efforts they are here for all of us. If you are a romantic and a shopper you’re going to love it here. The streets are blazoned with chic boutiques, art studios, specialty shops, restaurants, hip bars and just cool places to hang out. All of it framed in timeless beauty of Victorian architecture. The City of Galveston Texas has come full circle. Through the mid 1800’s to early 1900’s it was a vital port. In late 1880’s the beaches made it a tourist destination. Today several premier cruise ship companies call Galveston home. 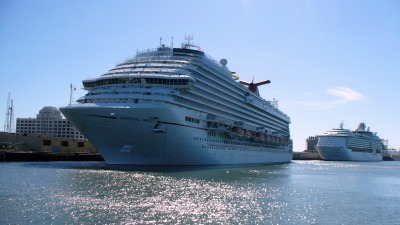 Each year a quarter million passengers depart from its harbor. The city can be suddenly bustling with thousands of tourists. Many tourists come from around the world. 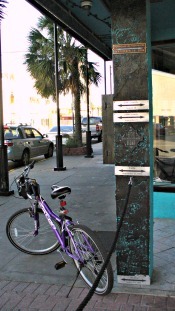 It’s a lot fun watching people discovering City of Galveston Texas. I’ve met people who didn’t know Galveston was an island. Then enjoy their surprise seeing the amazing buildings and homes. Their cameras keep on clicking. The City of Galveston Texas works its magic. 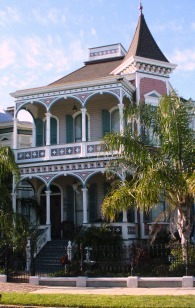 Beside the City of Galveston being a living museum, several museums are here. They are an easy walk to get to. And it takes about an hour to visit each one. That makes one nonstop day- shopping, sightseeing and of course dining. At the West end of Strand Street is a great Art Deco building. That's it at the end of this street. It used to be The Old Santé Fe building. Now it’s’ Shearn Moody Plaza, and its home to the Galveston Railroad Museum. Across Harborside Street, the Ocean Star offshore drilling Museum; Texas seaport Museum; and Pier 21. One of my island pleasures is a late night bicycle ride through the city. The mood is set during the leisurely ride toward town. It’s a tranquil ride past softly lite Victorian homes. With a gentle Gulf breeze stirring their palms they seem shy you noticed them at all. The homes are beautiful and elegant. Slowly riding onto the gas lighted streets it’s easy to live in the moment. Just take it in; sights, sounds, smells, breeze on your skin. Throughout the city you will find plaques. These tell of important locations, events and prominent people. And there were many of them. One emblem that consistently appears is the, 1900 Survivor sign. 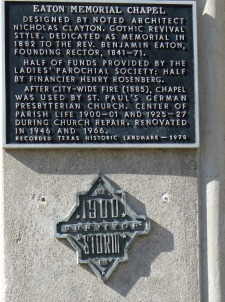 It designates that building, church or house survived that great storm of 1900. The water is how high? You’ll eventually come across high water marks. One that really makes the point is at the entrance of the Stork Club. It’s located on Post Office street. It is a dramatic reminder of the clashes between Galveston and the Gulf of Mexico. See the four chrome markers? Look above them to a brass colored one. Um hum, that's it. If you are driving into town parking is available. Either on street parking or parking lots is available. If you are walking the city, public restrooms are available. Look for signs at street corners pointing the way. 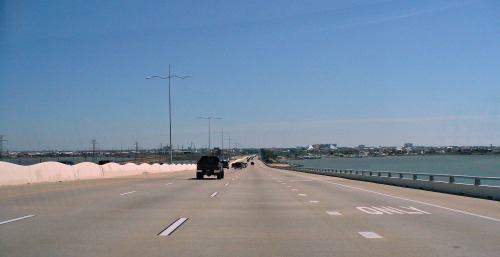 The City hosts several major events; Mardi gras, Feb 21 to March 4th. Last year, 2013, City of Galveston had more attendees than New Orleans, Mardi gras! In the city all night balcony parties; fun, loud and colorful! The lone Star Motorcycle Rally, October 21 to November 3rd crowds of 250,000 are typical. Dickens on the Strand, December 7 and 8th. You will be swept up in the festivities. The event is filled with fantastic costumes from the Victorian era. The venders, musicians and performers will transport you into the 19th century. This celebrates the time when British Empire and Galveston had strong cultural and economic ties. During that time Galveston was the richest most prosperous city in all Texas. Leave City of Galveston Texas and return to Galveston Travel and Charm Homepage.